One of the most popular subjects in books, magazines and social media is food — the things we should or should not eat (or at least not too much). While losing weight is a popular focus, it's only one part of the whole — a balanced diet that supplies the nutrients we need to be healthy. What you eat can also make a difference in your oral health. Here are 4 changes you should make to your dietary habits to cut down on the risk of dental disease. Adopt a nutritionally sound diet plan. When we say diet, we're not talking about the latest weight-loss sensation — we mean a planned way of eating for life. For most people, that's a balanced diet of fresh fruits and vegetables, protein and dairy. 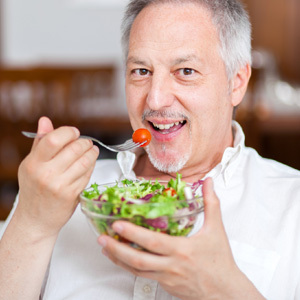 Your teeth and gums have the best chance of remaining strong and healthy with a nutrient-rich diet. Manage your sugar intake. Sugar and similar carbohydrates are a rich food source for bacteria that cause dental disease. It's important then that you keep your sugar consumption within limits: don't eat more than six teaspoons of processed sugar a day (or three for a child); avoid sugary snacks between meals; and try to satisfy your sweet tooth with the natural sugars found in fresh fruits and vegetables. Cut back on acidic beverages. Sodas, juices, sports and energy drinks are all the rage. They're also high in acid, which at chronic levels can soften and erode tooth enamel. So, try to drink them only at meal times and avoid sipping on them over long periods. And, if you're hydrating yourself after moderate work or exercise, try nature's perfect hydrator — water. Avoid eating before bedtime. A good portion of the acid in our mouths after we eat can be neutralized by saliva. As we sleep, though, our saliva flow slows down and doesn't have the same buffering power as it does during the day. So, try not to eat as least an hour before you turn in for the night, especially foods with added sugar.